Entry level jobs, and how to get them, are a major concern for everyone new to the job market. The best way of getting entry level welding jobs will vary from person to person, and would be specific to your situation. In discussing entry level jobs as a Welder, you need to appreciate that there are many different ways to tackle the problem. You also need to appreciate that while some of these ways may appear to be a "short-cut", that is not necessarily the case. At the end of the day, you still need the skills and experience to perform the job of Welder. No skill is acquired without hands-on practice. No experience is gained without actually doing the work. No knowledge is gained without actually applying effort. In this regard, it is important to internalize the old adage: There is no teaching. There is only learning. Please understand that there are many different welding codes, based on the type of component being welded, and the industry involved. In addition, there are potentially many different coding tests, depending on the types of materials to be welded, the welding processes to be used, and a long list of other variables. To be able to perform Welds that meet the requirements of a specific code, the minimum requirement is generally to pass the necessary coding test/s. In theory then, it is possible to practice some welding for a week or so and then perform a specific coding test. If you can pass it to the code specified quality requirements, then you have met the minimum requirements to qualify for entry level jobs as Welder. Some employers will require nothing more than this, before offering entry level jobs for Welders. Reality is however a lot rougher than this theoretical situation described. Generally the well paid Welder jobs require the Welder to be able to successfully weld a number of different coding coupons, using different welding processes and different materials in different welding positions. 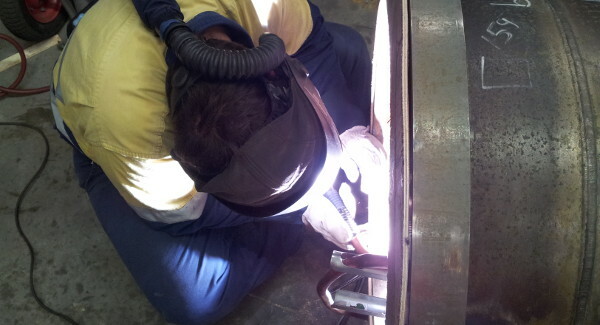 Additionally the testing process is undertaken under the supervision of a welding Inspector. If it is apparent to the Inspector that you are "struggling", then s/he will terminate the test, and then it is goodbye to you. In addition, most employers will want to see that you have a CV indicating that you have prior experience in doing the type of work that they want you to do. This does not come from practicing in a welding bay alone. The reality is therefore that you need to have reasonable expectations about how easy or difficult it is to land entry level jobs as a Welder. Below we will look at some typical ways of becoming a Welder, so that you can qualify for those welding entry level jobs. Welders can follow an apprenticeship in the same way as any other artisan / journeyman / tradesman. The good thing with being a Welder apprentice is that your employer typically pays for your training while you are also exposed to an actual industrial environment. Operating welding equipment and supplying materials to use is a rather expensive exercise. Few youngsters starting out in life can actually carry the costs involved with getting to a reasonably high level of skill to be able to pass a significant number of coding tests. In addition, if you are young and just starting to look for entry level jobs in welding, then the chances are good that you have very little appreciation for everything that goes into the whole construction exercise. A good apprenticeship will guide you into this life of engineering, and allow you to follow a path to achieving not only the welding skills required, but also a qualification that will stand you in good stead in the future. Some employers will only employ a Welder with a trade certificate, which means that you will have an advantage over the Welder without the trade certificate. This situation is however not very widespread, so it is not a huge advantage in itself. A full apprenticeship typically runs for 3 years and includes theoretical studies and practical hands-on welding. In most apprenticeship schemes you are actually being paid a small salary while getting your qualification, which makes apprenticeships very attractive as entry level jobs. In this scenario, your employer may require you to work for them for a minimum time period after your qualification, to compensate them for their time and effort getting you through your unproductive stage. In quiet economic times this obligation can in fact be a bonus, as it may be difficult to find work on your own until you have some good experience you can reference on your CV. Just a word of caution. Before applying to a specific company for an apprenticeship, it is important to make sure that they have a good reputation for their apprenticeship program. There are some unscrupulous operators that string youngsters along for years, paying a very low wage, and you never actually get to the point where you receive your papers as an artisan. Beware that you are not tricked into the employ of such organizations. 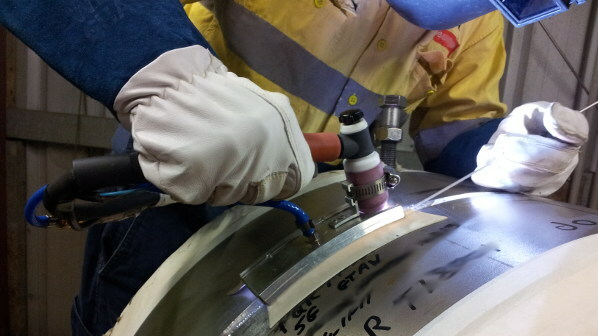 Gas Tungsten Arc Welding (GTAW) During Maintenance Activities. Given the fact that you only really need to be able to pass some coding tests (and some of the coding tests for the less critical work are actually quite simple) to get some entry level jobs as a Welder, there are quite a number of Welder training schools opening up. Depending on your level of prior experience, these schools will offer to train you to be able to pass certain of the coding tests. This approach to qualifying for entry level jobs is actually quite attractive if you have already worked in industry for a while, and you have a good appreciation for what it takes to be a Welder. Maybe you have even tried your hand at welding on an "unofficial" basis and you believe that you have a flair for it. If this is you, then this approach may be a good fit for you to get to the level required for entry level jobs in welding. The costs can however be quite high, if you want to gain a wide range of skills with different welding processes and materials. The best way to use this path to a career as a Welder is to see it as a stepping stone to advancing your career. You first do a very basic course that allows you to do simple structural welds with Shielded Metal Arc Welding (SMAW – Also called stick welding.) on carbon steel. This test is simple and will give you the skills required to perform the simplest of ad-hoc welding jobs. Then you try to get entry level jobs doing such simple welds. A general maintenance shop servicing the agricultural sector or making simple structures such as fencing would be good places to start looking. As you gain experience and additional skills with your SMAW, look for more demanding jobs where you can apply those skills. Once you have done quite a bit of this type of work, and you have built some confidence, then you can go back to the welding college for the next step. The next step may be to learn a welding process such as Gas Tungsten Arc Welding. (GTAW – Also known as TIG welding) This is the "go-to" process for work where high levels of control is required. If you can pass a test coupon in a pipe using the GTAW process for the root and second pass, and you can finish off the fill and cap passes with SMAW, then you can start looking for entry level jobs in workshops doing pipe welding. If you can get into such a job, then the rest of the process will become apparent in terms of additional welding processes and materials etc. Often these types of workshops will also provide you with the opportunity to practice new skills and expand your coding. Just a word of caution regarding these private Welder training schools. As a general rule you will receive very little theoretical training. You can never be a good Welder without having an appreciation for the theoretical aspects of design, metallurgy, welding codes, non-destructive testing (NDT) and welding power sources. As such, you must only consider the practical training you receive as a starting point. You need to do your own studies and enquiries into these other fields impacting you as a Welder. WelderDestiny would be an excellent source to gain some of this additional theoretical knowledge. If you can get an entry level job as an assistant in a welding workshop, you should be able to speak to your boss about picking up some informal welding experience. This would only be possible if you can also get some of the experienced welders to give you some pointers. If you can gain some skills as a Welder, then the boss may be able to use you to do some non-critical welding work for the cost of an assistant. That way you both win. Obviously you will need to practice in your own time, but if the company can pick up the cost of welding consumables, then you are ahead on this deal. Most workshops generate a lot of scrap materials for you to use for practicing, so this aspect should not cost the workshop anything. This type of informal set-up is a rather uncertain road to getting the necessary skills as a Welder, but would be a really beneficial way forward for people that already have a job in a welding workshop, and are not in a position to take a knock on their income by following a more formal route. If you can convince your boss that you are worth investing in, this way forward may be the best compromise for you. The big disadvantage of this process is obviously that you do not have much control of the process. You also do not have much leverage in terms of doing actual coding tests and subsequently getting a more formal career as Welder up and running. Really this will depend a lot on your relationship with the company you are working for. This is why it is very important not to burn bridges in any of your professional relationships. Many countries or states have funding programs in place for artisan training. A good place to start, to see what funding arrangements are in place for Welders, is to contact your national welding body. (e.g. AWS in the USA; TWI in England; WTIA or AIW in Australia; SAIW in South Africa etc.) Often these bodies have secured funding themselves for Welder training, and could in fact be operating a "semi-private" welding school themselves. In developing economies, it is not uncommon to come across a Welder that has a very limited ability to read or write. These Welders are still able to function, because their Supervisor will take the time and trouble to make sure that they know exactly what is required before they start on the job. I am afraid that in the new information driven economy that we are heading into, such Welders will be pushed to the margin. Even entry level jobs will require you to be able to read and write and calculate. As automation increases, the theoretical technical skills associated with the job of being a Welder will increase greatly. A Welder will be required to work much more autonomously, meaning that it will be impossible to employ a Welder that needs a lot of "hand holding" to get a job done. The time is coming when the welding procedure (WPS) will be transmitted to the Welder electronically along with all his / her other instructions. There will be an expectation that the Welder will be able to interpret all the welding instructions and set-up the necessary equipment and control the required consumables all by themselves. This level of autonomy cannot be achieved by people without reasonable levels of literacy and numeracy. Having said this, you do not need to be Shakespeare or Einstein to be a Welder. You must however appreciate that the job of being a Welder will become more theoretical as the waves of change from the information economy washes over us. So, if you are not a great reader, now is the time to change that! Decide that you will take up reading on a regular basis. Whether this is fiction or non-fiction is probably not that important. Just get yourself to the point where you are comfortable reading and understanding a complex set of instructions, and doing basic arithmetic. Even reading technical information from websites is a great starting point. It is important to understand that the job as Welder is a very good starting point for a number of other jobs within the welding and construction world. If you really like the practical hands-on aspect of being a Welder, then by all means keep going till you retire, but also understand that being a Welder is not a dead end job. It is quite easy to progress onto other jobs with further training, if you would prefer. Click here to get an idea of the other jobs that you can typically move into. Most of the national welding institutes and societies provide good information on welding training. Follow this link for information on The Welding Institute (TWI - UK) website. Follow this link for information from the American Welding Society (AWS - USA) website.